With a Father who was a Chiropractor and Olympian with 20 National Titles, Dr Saxon (chiropractor) had a drug free childhood, instead receiving adjustments since birth. While most kids were drinking Coke, we drank carrot juice, daily exercise was the norm and getting sick enough to need a day off school was a very rare thing indeed. I had my first antibiotics at age 30 and have taken a total of 5 paracetamol pills in my life. After completing a Bachelor of Science and receiving First Class Honours for his dissertation The Effects of Exercise On Immune Function, Dr Saxon (chiropractor) received an Australian National Scholarship to complete a Doctor of Philosophy in cancer genetics. Although I found genetics fascinating, I went to a big conference in America where everyone was talking about drugs and totally ignoring lifestyle factors that contribute to disease. It dawned on me that I was in the wrong place. 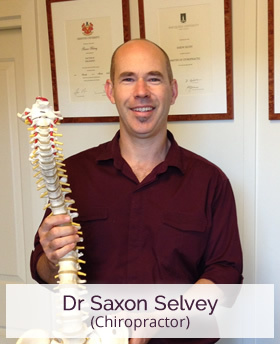 Once he decided to change professions, Dr Saxon (chiropractor) entered Macquarie University in Sydney. He completed his Bachelor of Chiropractic Science and Master of Chiropractic degrees there, which ultimately led to sharing the benefits of chiropractic with the Wodonga community. Now practicing 11 years in Wodonga, Dr Saxon (chiropractor) has prioritised staying up to date with the latest research in health. He attends regular conferences to continue his education, bringing the benefit of his knowledge to patients at Healthy Living Family Chiropractic. Outside of work, Dr Saxon (chiropractor) is a gym fanatic. You can find him at Genesis Fitness a few times a week, and he’s participated in powerlifting competitions at Slaughterhouse Gym. He enjoys family BBQs with his beautiful wife and two cheeky daughters and going motorcycle riding in the mountains. Healthy Living Family Chiropractic offers convenient same-day appointments, so you can get the immediate attention you need. Contact us today!